The Rev. Susan Berry Taylor of St. Andrew's Episcopal Church continued a tradition Wednesday of meeting people on the street during Ash Wednesday. 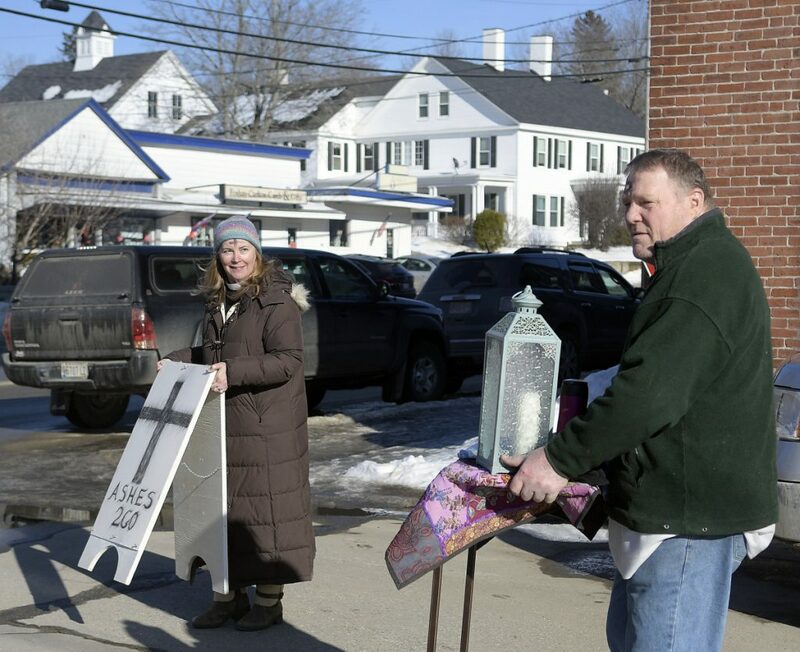 WINTHROP — It was a mixture of ashes and roses as Ash Wednesday coincided with Valentine’s Day, and the Rev. Susan Berry Taylor of St. Andrew’s Episcopal Church was right in the middle of it downtown. 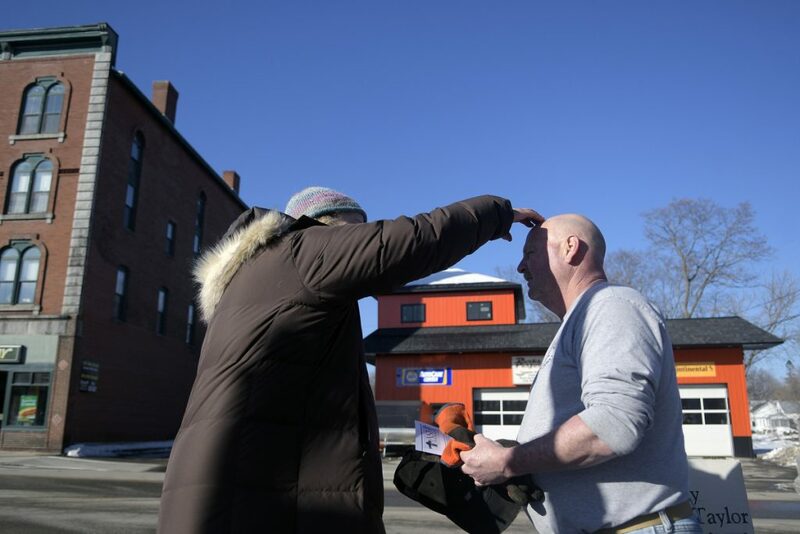 Both she and church member Bob Somes of Readfield, who was standing with her, had crosses of ash on their foreheads. Taylor, who is an artist as well as a priest, said she resisted the temptation to draw hearts rather than crosses with the ashes in honor of Valentine’s Day, which is also know as the Feast of St. Valentine. Just off Main Street next to the Winthrop Commerce Center, they had set up a small portable table with a few items, including pamphlets with information about Ash Wednesday and about St. Andrews’ Mission. The “Ashes 2 Go” event from noon to 3 p.m. was a community outreach. While this is her first year offering ashes in Winthrop, she recalled her 2011 experience as a seminarian in at the Episcopal Divinity School in Cambridge. She said the seminarians in their purple cassocks would set up near a subway station and many grateful people stopped for ashes. In 2016, the Rev. James Gill of St. Andrew’s, offered ashes in front of Pete’s Roast Beef in Winthrop. Wednesday’s community outreach was to be followed by an Ash Wednesday service at 5:30 p.m. at the church at 219 Winthrop Center Road (also known as Route 135 south), a building that also is known as The Friends Meeting House. On Tuesday night, those two groups joined with the Winthrop Congregational Church, United Church of Christ, for a Mardi Gras event with some jambalaya and King Cake, reminiscent of New Orleans and other Carnival celebrations, and crafts and games. 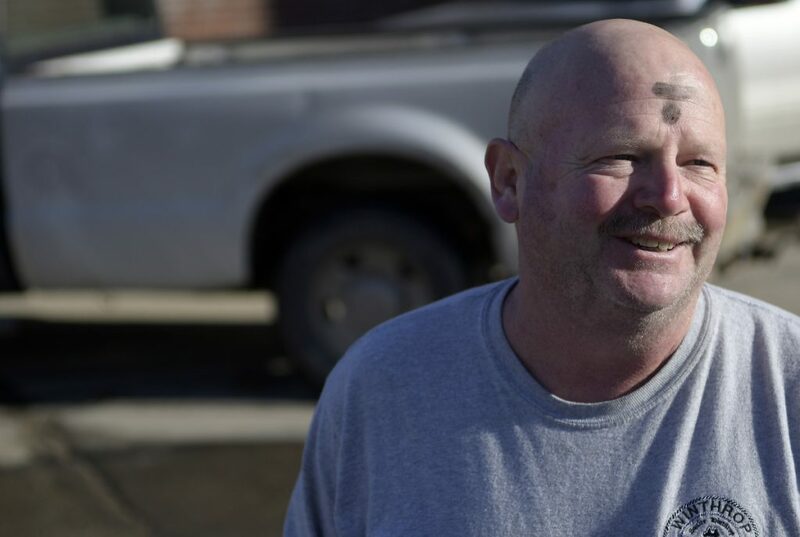 In many Christian churches, Ash Wednesday is the official beginning of the Lenten season, and church services involve placing ashes on the foreheads of the anyone who wishes it. The practice symbolizes penance and reminds people that eventually they will return to dust. Ash Wednesday is also a day of prayer and fasting and abstinence for many people — posing a quandary for people who wanted to indulge in the chocolate and other sweets from their sweethearts. Taylor said she had several interactions Wednesday afternoon, including one with a man who told her several people in the building had complained about her setting up outside the Commerce Center, and then a couple who talked to her for a while, and then returned a half hour later. They both ended up getting ashes. “I’ve never had anyone make a return visit before,” Taylor said.